There are 200 species of owls in the world. They have very good sense of hearing and eyesight. You can find them everywhere in the world except for Antarctica, most of Greenland and some isolated islands. Their eggs are white and sphere shaped. They lay about a few up to a dozen of eggs, depending on the species. The mother owl takes her time to lay eggs. The eggs are laid at intervals of 1 to 3 days and not in one go. Unlike other birds, owls do not make their nests. They look for a sheltered nesting site or an abandoned nest in trees, underground burrows or in buildings, barns and caves. Most owls are active at night and sleep during the day, just like bats. Some are active during the twilight hours of dawn and dusk, for example, the Pygmy Owl. A few owls are active during the day, for example, the Burrowing Owl and the Short-Eared Owl. Owls are able to hunt quietly and surprise their prey very well. This is because they are covered with dull-colored feathers which make them hard to see. Owls tend to copy the colors of their surroundings. 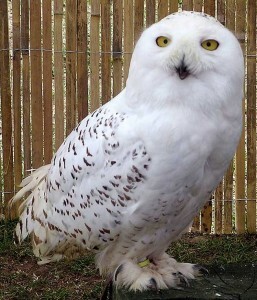 For example, the White Owl, which is bleach white, blends perfectly well in their snowy surroundings. 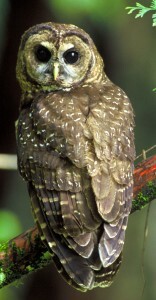 The Muted Wood-Owl which has brown, tan and black feathers make it almost impossible to locate them among the trees in the forest. The world’s biggest owl is the Eurasian Eagle Owl. The biggest ever owl was the Cuban Giant Owl, which stood about 1.1 metres (43 inches) tall! They have special wings which allow them to fly silently. They have a sharp beak and powerful sharp claws which are used to kill their prey. Then, they swallow it whole unless it is too big. Their beak is short, curved and facing downward. Because it faces downward, it doesn’t block their view in front. They feed on insects and small rodents like mice, rats and rabbits. Some only eat fish. The owls are unable to move their eyes, but they can move their head 270 degrees around! Isn’t that amazing? Since they can look around without moving their body, they make much less sound as they hunt for prey. Owls’ eyes are placed side by side not like other birds. Therefore they are able to use both eyes to see distant objects. But they are far-sighted and cannot see objects just a few centimetres in front of their eyes. Owls have ears which are placed at different places on the skull. This helps the owl to figure out where its prey is. They are able to detect the even the tiniest sound of a creeping mouse.